Soo old fashioned, yet they're 2016-17 vintage. Hmm they don't even list the lumens on the etch OR the box?! LOL at "Bright lights". Not with a 10K hour 130V lamp. I'd be surprised if the 100W lamp was more than 800L. Awesome they're still made though. Absolutely love the center lamp. I have a huge soft spot for inside frost lamps. @Mike they have the lamp specs on the back cover of the sleeves. Yeah, lol but they're bright in that they're USA made. 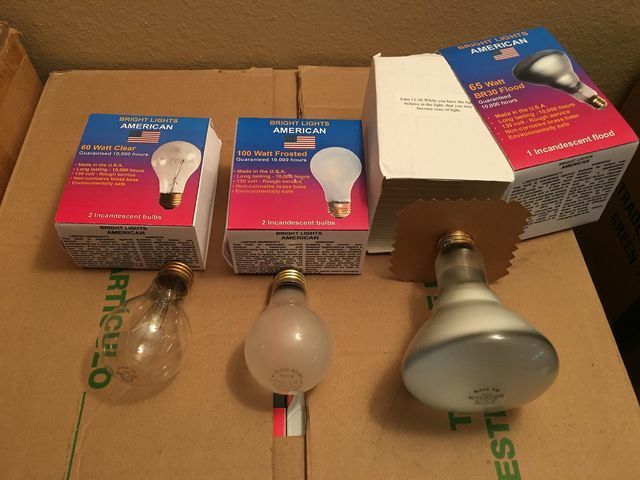 @Ace check out https://www.brightlights-inc.com/ you can order online. Cool! Made in Mullins, SC, that's close to being locally made for me I'll have to look into those BR-30 bulbs. UPDATE: Unfortunately, they are no longer made. Both the Mullins, SC and Meadville, PA factories closed down. Bright Lights American is selling off its remaining inventory. I got a bunch of bulbs this month. If you guys want. you can order them off brightlights-inc.com until December 31st, 2018. Newcandescent is gone now too. They're now "Newcandescent-LED".